Greater Phoenix is electric—from buzzy nightlife to illuminating outdoor experiences. Recently, Desert Botanical Garden made Greater Phoenix's electric vibe official with Electric Desert | A Light and Sound Experience by Klip Collective. Visit the Garden where cactus and desert become a living canvas in this nighttime experience, taking visitors on a journey using light and original music. After this unique nightscape experience, return to one of our participating properties and in the morning, enjoy breakfast for two, on us, for each night of your stay. Electric Desert and our delicious breakfast will keep your current flowing! Don’t forget to book your tickets for Electric Desert! Booking Instructions: Book your stay at https://www.marriott.com/specials/mesOffer.mi?marrOfferId=1324943&displayLink=true. Be sure that promotional code S4B appears in the Corporate/Promotional code box when making your online reservation, or call 1-800-228-9290 in the US and ask for promotional code S4B. Price Description: Price includes breakfast for two, each night of your stay. Does not include tickets to Electric Desert. 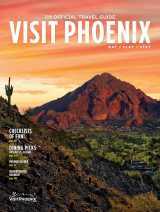 Order a FREE guide to help you plan lodging, dining, and things to do on your next trip to Phoenix. Get our emails with the biggest events, deals and other cool things in the Greater Phoenix area.